When I wear a scent to work, I try to be as discreet as possible: I don't want to annoy or sicken anyone, and besides, I wear scents for myself, not for anyone else. But on my way to work recently I put on an extra spritz of the sublime L'Instant de Guerlain Pour Homme (on top of the one I'd already applied just after showering), and when I got there, damned if every single woman who works in the joint didn't compliment me on it. Every one of them, even the one who's allergic to most scents. Is it just that it's a really great scent (my description of it, I now realize, really didn't do it justice), or is that it works perfectly with me? Either way, it's going into heavy rotation: I love it, other people love it, and that's all I need. Todd Oldham starts out with kiwi and cucumber with a smudge of mango and peach. The cucumber note adds a fresh kick, but the fruit notes are already warm: this scent advertises itself as an oriental right out of the bottle. There are floral notes in the middle, but they're subdued; even tuberose--that turbulent va-va-voom scent--is more a suggestion than an outright fragrance note.The middle notes are butched up a little with spices, but the whole show is about those dramatic oriental base notes, and this scent has them in abundance: ambergris and a touch of patchouli, sandalwood, and most of all, befitting this very gourmand scent, bucketfuls of vanilla. Unsurprisingly, the scent lasts a long, long time on the skin. 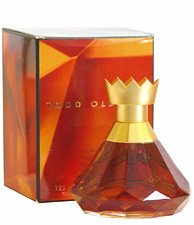 As is so often the case with orientals, Todd Oldham isn't particularly marked as a women's scent. Yes, it has fruit notes in the top and floral notes in the middle, but it's not flowery or girly: it's warm and sweet and comforting, and those qualities don't have a gender. (If only it had caught on and there'd been a men's version, though: that would have been something indeed. Square off the bottle but keep the crown--or is it Jughead's hat?--and you're all set.) There'll always be men who are afraid to wear anything marketed to women, but if something smells good, and more importantly smells good on you, why fight it? Part of the pleasure of L'Artisan Parfumeur's Les Epices trio is the presentation, which starts with the box. It's in matte black card stock, thin but not cheap, with gold print--the numero-uno way to show how classy you are (see also Estee Lauder's Spellbound and Dolce and Gabbana's Sicily, among many others). The top isn't the typical tab-and-slot closure, either; it's four flaps that tuck into one another, an abstract hint at the object inside. Inside that is a little leaflet containing typically breathless and giddy descriptions of the scents (in both English and French, nice touch) and the main event, a circular Chinese-red satin box. Lifting off the lid reveals three tiny 15-mL duplicates of the standard 50-mL L'Artisan bottle, but rescaled--they're not just miniatures, they're tall and slim and gorgeous. If every company made 15-mL bottles, that's all I'd ever buy, because I am never, ever going to use up most of what I have, but these are ideal. Safran Troublant is translated to "Saffron Spell", but "troublant" actually means "disturbing", which, I assume, wasn't used because it has more than one meaning in English. The scent, like the other two, starts off as one thing and gradually becomes another, and in this case, the opening note is saffron, spicy and medicinal. I disliked Comptoir Sud Pacifique's Safranier because it was overloaded with that typically medicinal smell (the reason saffron in cooking has to be used with such discretion), but Safran Troublant gets it exactly right. Although there aren't any other spice notes listed, it seems to me that there's also a dose of clove in there. Close behind the initial saffron note is a thrilling surprise--a full-bodied rose note which, although short-lived, is ravishing while it lasts. As with Piment Brûlant and Poivre Piquant, the saffron note is very slowly eclipsed by the secondary note, in this case vanilla, which percolates up and takes over until it's all that's left. And that's the problem. The whole thing is beautiful, but the vanilla is, in fact, too much and not enough. There are so many vanilla scents on the market (L'Artisan already has one of the best, Vanilia) that this one seems, after the saffron has died away, rather ordinary. 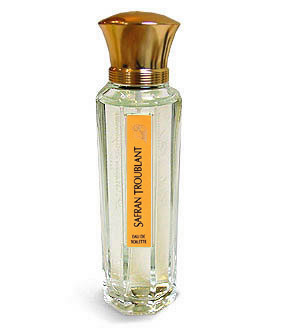 I still love Safran Troublant--the novelty of saffron and rose is what makes it work--but, like Piment Brûlant, it could have been more. 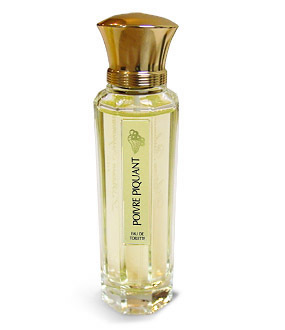 When I first tried the three scents in L'Artisan Parfumeur's Les Epices de la Passion, I was immediately smitten by Piment Brûlant; it smelled intoxicatingly of chocolate and it lasted just about forever on the skin. It still does both those things, but something's changed. It's nice, but it's not amazing any more. Have I become habituated to chocolate scents (surrounded as I am by such things as CSP's Amour de Cacao, The Body Shop's Amorito, and Yves Rocher's Cocoon)? Has my nose changed? Has my skin? Piment Brûlant--"burning-hot pepper"--starts out very red, with a rush of red pepper and a surprising floral note that, it turns out, is poppy. The poppy note vanishes in a matter of seconds, certainly less than a minute; the red pepper that remains is much softer and more muted than that in the top note of Givenchy's Xeryus Rouge (which is a startlingly crisp and realistic red pepper). As is the case with all three Les Epices scents, another note wells up to join and finally subsume the top note, and in this case, it's chocolate, warm and only slightly sweet. This is clearly the scent of the concoctions that Vianne plies her customers with in Chocolat, and it's lovely. But--and I can't believe I'm saying this--it's too simple. It needs more of something, and, not being a perfumer, I don't know exactly what. Spices? Vanilla? Something inedible such as ambergris? Whatever it is, isn't not there, and the complete lack of development after the chocolate note rises up makes the scent less than it ought to have been. (Poivre Piquant is equally simple, but the sharpness of the pepper and the complexity of the milky note make it work much better.) 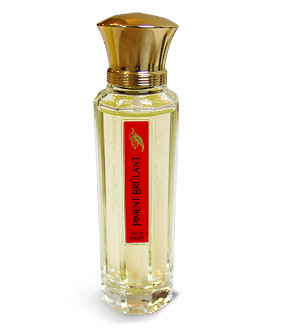 Piment Brûlant is still a pleasure to wear, but it could have been so much more. A few years ago, I did a fragrance swap with someone: I always like to throw in a bunch of samples, and luckily for me, they did, too, because I wound up with a set of three vials of the then-new collection by L'Artisan Parfumeur, "Les Epices de la Passion", three spice-based scents which manage to be subtle yet distinctive, gourmand yet unsweet, at the same time. I liked all three, but was madly in love with one, Piment Brûlant, a heady blend of chocolate and red pepper. I used the three vials sparingly, but of course one day they ran out. I knew I had to own the set, and finally, earlier this year, I ordered it online. It's funny how your tastes change over time; the one that mesmerized me back then is now merely an appealing part of my collection, while the one I liked the least has become my favourite by far. But the perfumer is not done: after grinding his spices before us, he slowly stirs them into a pot of hot milk, barely sweetened. The milky note--so similar to that at the base of the equally strange and fascinating Le Feu D'Issey--slowly rises up to envelop the hard edges of the pepper and the bitter-herbal licorice. From then on there's little development, just a slow cooking of the few carefully-chosen ingredients. Complexity is a good thing in art, but sometimes utter simplicity is what we long for: sometimes less is more, and the stripped-down, intellectualized, flawless Poivre Piquant is the perfect illustration of that maxim. When I started this blog, I hoped to post three times a week, which I still try to do, but it's been three weeks. How can it have been three weeks? Easy. Jim was on vacation for two and a half weeks, and he really, really hates commercial scents, so I suppose for him, living with me is like living with a smoker. I occasionally snuck a spritz on the way to work, or if he left early to go to the gym, but otherwise I was more or less scentless, and I just can''t write about them if I'm not wearing them. And during those two and a half weeks, it turned out that I lied to myself. I said I wasn't going to buy those two Demeters (Blue Hawaiian and Orange Cream Pop) and then I went and did. But they were so cheap! And I wanted them! And now I have to promise myself not to buy anything for a while. A couple months, at least. I'll let you know how that goes. Pineapple hasn't been used as a note in perfumery for long, perhaps twenty years. My first encounter with it was in the 1989 women's scent Only (by Julio Iglesias), which is also my first experience with a fragrance that apparently wasn't meant to be blended in the traditional sense: the pineapple note stuck out like a pushpin in a corkboard. There have been plenty of other scents in the intervening years that use pineapple as a note, most famously CK One, but also Perry Ellis America for Men (which has it as kind of a shock wave in the top note) and Ferragamo's Incanto Dream. Lately--maybe because it's summer--I can't seem to get enough of that pineapple note, which is probably why I succumbed to two different pineapple-based scents in less than a month. Demeter Blue Hawaiian is supposedly concocted to smell like the cocktail of the same name (composed of blue curaçao, pineapple juice, and rum), but what it smells of first and foremost is pineapple juice, and it's stunningly accurate--it smells like a freshly peeled and cored pineapple, ripely tropical. It's a happy scent, as perhaps something based on an alcoholic drink ought to be. (The orange-rind note of curaçao isn't strong, just a little knife cutting through the sweetness of the pineapple, and the rum isn't evident to me at all.) 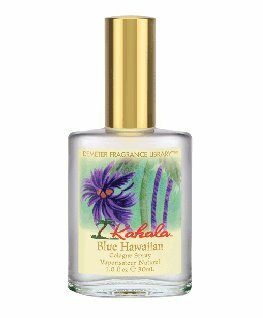 Unlike most Demeter scents, this one has some real lasting power: even after showering I can smell a soft Pacific glow on my skin. CSP's Vanille Pineapple is a very different animal, but wonderful in its own way. Where the Demeter is bare, stripped-down, the CSP is rich and florid. The giddy freshness of the pineapple juice has been softened and warmed up with not only vanilla but also a shot of coconut milk, not enough to give it a cheap piña-colada smell but enough to intensify that tropical feeling. As is typical of the newer CSP formulations, the pineapple smell isn't long-lasting: it trails away after a couple of hours, and what remains on the skin is a slightly spicy, slightly musky vanilla--not quite the standard CSP vanilla, because it has a trace of cinnamon. Now that summer's over, perhaps pineapple won't seem quite so necessary, but I'm glad to have stumbled across these two.